The program “Learning through play” developed by NGO SIRIRI is a “turn key project“. It brings together modern teaching methods for Central African teachers and the creation, printing and distribution of teaching tools (the ABC book) in the pupils’ mother tongue, Sango. The Central African Republic (CAR), seriously affected by a bloody conflict, is one of the poorest countries in the world. If it is ever to move forward and become an independent and stable country, it needs educated people. Education, however, is impossible without competent teachers and relevant teaching materials; these are lacking in the CAR. An expert team consisting of Czech and Central African teachers and educational advisors has developed a comprehensive teaching method and guide book for teachers. We strongly believe that the method and teacher’s guide cater to the needs of the Central African teachers. They are in line with 21st century teaching standards and they are written in the local language, Sango. SIRIRI organised two training sessions for more than 150 teachers in September 2015 and 2016. As a result, over 13 000 pupils have already benefited from the ‘Learning through play’ teaching method. Interest in the program is steadily growing amongst teachers and parents in the CAR. Teachers are now asking for more ABC books in Sango and they would like to see the creation of new text books and new learning tools. In 2017 a team of 12 volonteers from the Czech Republic and France traveled to CAR. This year we tried something new: the teaching team was joined by 10 experienced CAR teachers who had been trained in previous years. 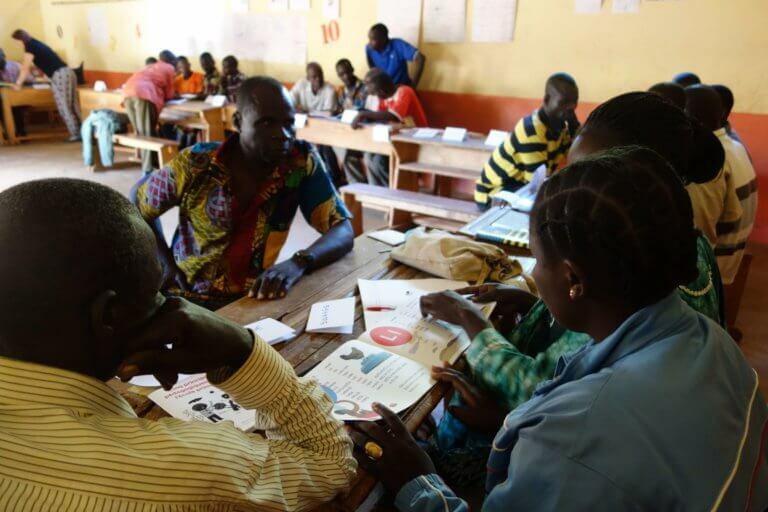 The team had 4 teacher trainers to train 244 teachers from towns and villages all over CAR, sometimes up to 200 km far from Bozoum, were the training session took place and where the Czech NGO SIRIRI support other projects. At the end of the course, one of the program’s initiators, F. Aurelio Gazzera, was invited by the Minister of Education to talk in detail about the ‘Learning through play’ training and it’s results. The Central African Republic is being destroyed by civil war and poverty. The current level of education in CAR is not likely to improve in the near future. The literacy rate among those 15 years old or more is only 56% in the CAR. According to the international index (prosperity.com), which compares countries on their access to education and the level taught, the CAR ranked 147nd out of 149. Before they go to school, children know only the most commonly used dialect, Sango. Education at school, however, is predominantly in French, which makes it difficult for children to master the basic curriculum. The level is poor. The Central African Ministry of Education is no longer able to guarantee regular payment of salaries to teachers or sufficient training. As far as teaching methods are concerned, teaching is based on memorising long texts or on copying texts in French. Often pupils do not even have notebooks or textbooks at their disposal; they usually have only a slate with a piece of chalk. What children need most is a reading method written in their language and teachers who know how to motivate them. Our program ensures both. 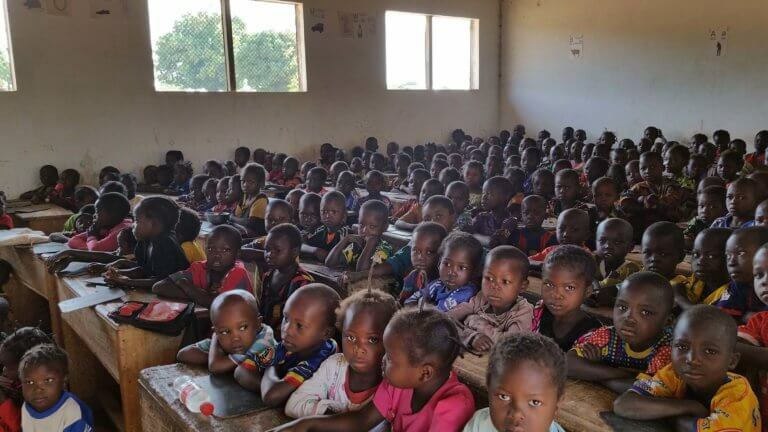 The idea underlying this program is to improve the quality of education in selected elementary schools in the CAR because primary school is often the only school level attended by a large number of Central African pupils. This program was initiated by the Czech organization SIRIRI, which has been working for nearly 10 years in the CAR, working closely with Carmelite missionaries. SIRIRI, in consultation with Czech experts in pedagogy, sought the most appropriate solution to support teachers in the CAR. We worked on the concept of our books with Central African teachers, who thus had the opportunity for the first time ever to teach in their mother tongue. The program has not been prepared by people “in an office”. We developed it through dialogue with local teachers who helped us to assess what the Central African education system really needs. There was no reading method in the CAR that we could have relied on to develop our own syllabary. Today we see the success of our method: demand is huge. In September 2015 and 2016, the SIRIRI workers organised pilot interactive courses in the Central-African provincial town of Bozoum for teachers at the lower primary schools of two counties. The aim of these seminars was to inspire these teachers to “meaningful education”, i.e. to strengthen the interaction between the teacher and the pupil in the teaching process. Following the Comenius’ ‘Learning through play’ (Schola Ludus) concept, we have set ourselves the goal of developing for children creativity, playfulness and the pleasure of learning. During these seminars, SIRIRI trainers and teachers were able to verify that even in a country of extreme poverty, it is still possible to work with teaching materials and in accordance with modern educational criteria. Many others contact us today to continue our training. How many teachers can we train in 2017? Educational seminars are based on a handbook we had tailored to the local teachers’ needs. We devised The Five Educational Principles Handbook. During the seminars the teachers were encouraged to ask questions, listen actively, improve their reading comprehension skills, to be creative and to develop basic pedagogical tools. Based on a sketch done by Czech artists David Böhm and Jiří Franta, a mural with didactic topics was created in two classrooms. It proved to be a useful alternative to missing textbooks and didactic images. 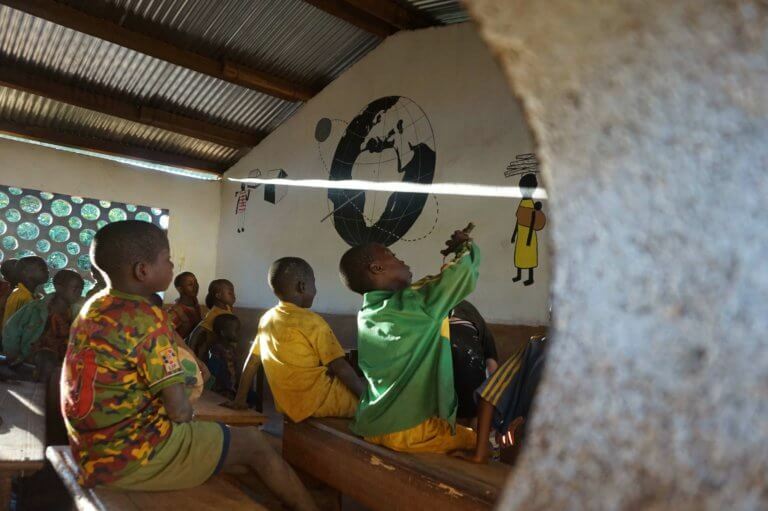 The pilot classrooms were equipped with the Living Alphabet illustrated set; the children had the ABC books in Sango. 5000 textbooks have been printed and delivered in 121 schools. The textbook was made in cooperation with the Central African teachers and Czech artists. Its aim is to enable children to learn the basic reading techniques. The ABC book will remain the property of the school, which will extend its use considerably. We need your help to sustain our project in CAR! We need your support to be able to respond to the strong demand generated by the Learning through Play program in CAR. In September 2015, 2 trainers trained 25 teachers from a school of about 800 students in Bozoum. 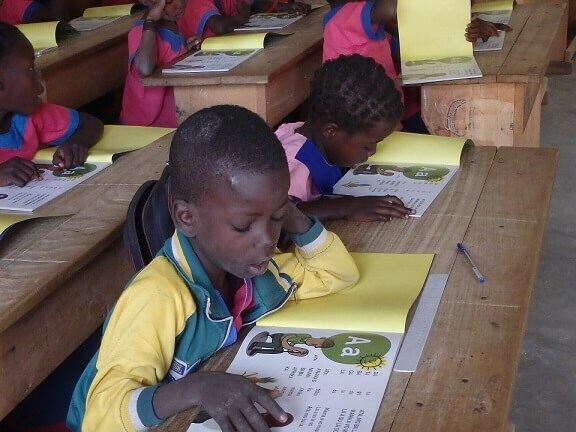 The first three pilot classes (150 students) were experimentally given the first ABC books in Sango. In September 2016, 10 trainers trained 130 teachers from 52 schools in two major regions. The teachers received 130 Living Alphabet illustrated set , 150 sets of letters and 5000 ABC books in Sango, for their class. The program opened the way to a quality education for 12,890 students. In August 2017, 12 European trainers and 12 co-trainers selected from the already trained teachers conducted a new seminar in front of 244 teachers from 62 schools from two regions (including 42 teachers students, 8 inspectors and directors). They brought 5,000 ABC books, 600 sets of letters and 250 living alphabets. In March 2018, SIRIRI representatives visited CAR again, saw the work made in 26 classes by trained teachers and tested the skills of 842 pupils. With these encouraging results, the evaluation report has defined recommendations for the next trainings. At the same time, a one-week course was held in Bangui for 73 student teachers from the John Paul II Institute. In August 2018, two seminars were held in Bozoum and Bouar. The courses brought together 14 Europeans and 25 Central African trainers to train 230 teachers from 90 different schools. 250 teaching guides have been distributed as well as 500 sets of letters and numbers. We are planing a new evaluation in CAR in january 2019.